The Money Writers is having a group writing project. Each of us have decided to share our asset allocation and performance from the first of the year to last Friday. You might want to put the children to sleep, this could get ugly. I would like to say that I put together a great graph for you, but I didn’t. My only excuse is what you already know… I’m Lazy. Instead I’ve put together my portfolio holdings inside my retirement accounts. You may ask why I don’t have significant money invested outside of retirement accounts. Good question and I’m not sure I have the best answer. I believe in having a healthy emergency fund as well as maxing out my retirement accounts (401Ks and Roth IRAs). I’ve also bought some significant private stock in companies I used to work at. I can’t sell these shares and I can’t communicate them to you (they’d give away my anonymity to a number of people). Below is my asset allocation. You’ll notice that one Roth 401k doesn’t make the tickers very readily available. I know I could look them up if I went to click through some PDFs, but it’s not really important to me. My goal with each account is to be fairly diversified. I know it’s not perfect diversification, but I plan to roll them over into a Zecco IRA when the economy rebounds. There I can invest in low cost ETF (as you’ll see in my Roth IRA where I have more trading ability). I don’t want to move it while the prices are low in the off chance that we get a recovery while I’m out of the market shifting the money. I don’t know if anything in particular sticks out with this asset allocation. I suppose the shares of Google stand out, since it’s the only single company that I specifically went out of my way to own. I like to think of it as a hedge. Many websites, including this one, rely to some degree on Google sending traffic which leads directly to advertising dollars. If Google continues to monopolize Internet search, I want to stand to gain in the off-chance that they update their algorithm to hurt my sites. That said, you can tell I still don’t have a lot of money in Google. The other thing that I find interesting is that I have just 20% of my money in international stocks. This is the first time that I’ve looked at it in totality and I’m disappointed in that allocation. I want to have much more money overseas. I don’t mean that to be anti-American.Â I think it’s simply arrogant to keep 80% of my money in one country. It’s not just any one country, but the one country that I depend on for my income. It feels like working at a company and investing in the company stock… one bad turn of events and you could be wiped out. You are probably wondering two things at this point. The first: What’s the return on portfolio like this? I’m 7.22% in the hole YTD. I would like to say that I found a way to stay positive, but the market has just not been good. Long term, I still think diversified equities is a solid investment. Wow. You have a lot of different funds. That doesn’t seem like the “Lazy Man” way. It seems like there would be too many things to keep track of. I understand the need to remain diversified across all of your accounts, but couldn’t you allocate the percentages you want across all accounts? In other words, have your entire 20% allocation of international funds in one of your 401k accounts, have 15% small cap (or whatever you allocation is) in another account, etc. – all totaling your combined asset allocation, but using fewer funds? I think this asset allocation thing is a lot over done. By its very defination using a mutual fund allocates your assets 1) to diffrent industries 2) to diffrent compaies. 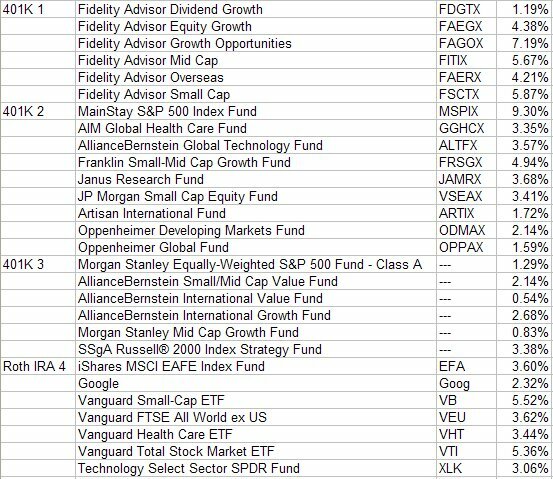 Each mutual fund typically has atleast 10 industries and 30 compnies (a lot more for the larger funds). A protfolio that has a small, medium and large company fund and an international fund is initslef sufficently allocated. The “Lazy” comes in the fact that I haven’t rolled these over into IRAs where I could consolidate with lower cost funds. Each of these accounts represent the diversification I had at a point of time when choosing the funds. I rebalance occasionally, but I don’t go back re-investigate why I chose the funds. I do know that they expense ratios are amongst the lowest I can choose (again, short of rolling them over, which I explained). I could do what the Travelin’ Man says, but it really only helps with my record keeping. If I shift all the money around, it’s still going to perform more or less the same. Plus I think that the small caps and international funds would have much lower overlap than say two S&P 500 funds. I really don’t mind being diversified across a few of them as long as it’s not costing me any more money (which it isn’t). -7.22% return beats the S&P. Congratulations. It seems your accounts have duplicated fund types, e.g. multiple small and mid cap funds. A simplification approach could be to use only one in each category of international, small cap, mid cap, growth etc. Have you calculated your expense ratio to see where it stands? Just curious. Not in years, since I opted into them. At the time they were very low cost funds. Most of the fund families I know well enough to know that they didn’t raise expenses much. Anyway, I’m looking to roll them over into low-cost ETFs, when the market recovers. I don’t want to be out of the market in a transfer when a recovery happens. I’m content to wait it out a year or two if necessary.